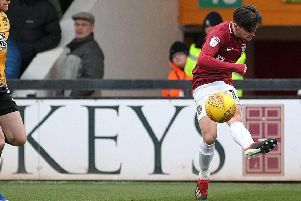 Rob Page has hinted strongly that he will make changes to the starting line-up for the Cobblers’ Sky Bet League One clash with Rochdale on Saturday (ko 3pm). The Town boss was hugely frustrated by his team’s shocking performance in the FA Cup loss at Stourbridge on Tuesday, and felt all of his players, the defence aside, were ‘off their game’. Page named an unchanged team for the trip to the War Memorial Stadium following Saturday’s 3-2 win at Port Vale, but it seems more or less certain he won’t be doing that again for the visit of Dale. “If you are not playing well, you run the risk of losing your position and I have always said that, since day one I was at the football club,” said the Town boss. “If you are off your game, there are others there that have been more than patient that are waiting to come in and grab that opportunity. “It gives other people an opportunity, but it’s whether I decide to do that or not. I have to pick a team that I think will win the game. “Then in hindsight, you might have made the changes and lose the game, then you kick yourself because you should have gone with the same 11. “I get paid to make those decisions, and I made the decision to stick with the same 11 and I have to stand by that now. And he added: “You talk about formations, and four weeks ago we were the second highest scorers in the division. “People see a 4-3-3 as a negative, well it’s not when we play it because when we do that we can have four centre forwards on the pitch. When you play 4-4-2 you only get two centre forwards on the pitch. “We create chance after chance playing 4-3-3, and we score seven in two games, and we have created chances playing in a 4-4-2 as well, so it is not about formations. “It’s about the players on the pitch, and we will have to pick a team and formation on Saturday that will combat Rochdale as well, because they are full of confidence. “They are capable of scoring goals and have some good players, so we have to be mindful of that.